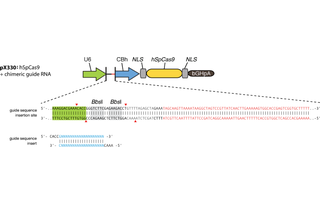 A human codon-optimized SpCas9 and chimeric guide RNA expression plasmid. For plasmid usage, please see the associated publication (Cong et al. Science. 2013, PMID: 23287718), as well as Ran et al. Nat Protoc. 2013, PMID: 24157548.